AMID the daily struggle that is Bailey Jankovic’s life, there is always laughter. 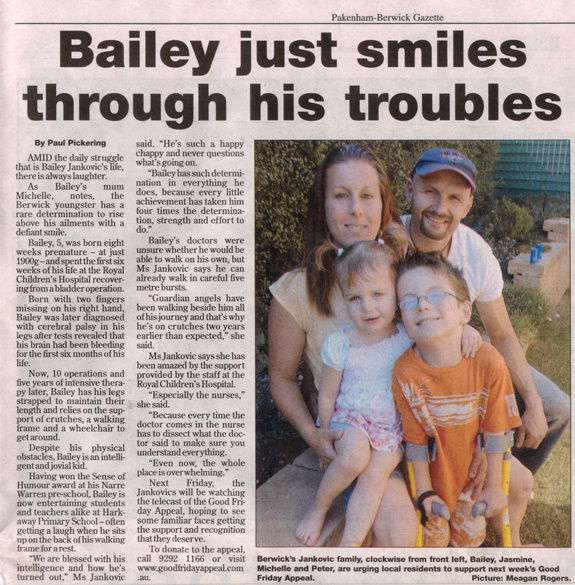 As Bailey’s mum Michelle, notes, the Berwick youngster has a rare determination to rise above his ailments with a defiant smile. Bailey, 5, was born eight weeks premature – at just 1900g – and spent the first six weeks of his life at the Royal Children’s Hospital recovering from a bladder operation. Born with two fingers missing on his right hand, Bailey was later diagnosed with cerebral palsy in his legs after tests revealed that his brain had been bleeding for the first six months of his life. Now, 10 operations and five years of intensive therapy later, Bailey has his legs strapped to maintain their length and relies on the support of crutches, a walking frame and a wheelchair to get around. Despite his physical obstacles, Bailey is an intelligent and jovial kid. Having won the Sense of Humour award at his Narre Warren pre-school, Bailey is now entertaining students and teachers alike at Harkaway Primary School – often getting a laugh when he sits up on the back of his walking frame for a rest. Bailey’s doctors were unsure whether he would be able to walk on his own, but Ms Jankovic says he can already walk in careful five metre bursts. “Guardian angels have been walking beside him all of his journey and that’s why he’s on crutches two years earlier than expected,” she said. Ms Jankovic says she has been amazed by the support provided by the staff at the Royal Children’s Hospital. “Especially the nurses,” she said. Next Friday, the Jankovics will be watching the telecast of the Good Friday Appeal, hoping to see some familiar faces getting the support and recognition that they deserve. To donate to the appeal, call 9292 1166 or visit www.goodfridayappeal.com.au.